When I decided that I was going to actually make Jasmine's shoes I researched and looked online for any sort of tutorial that I could follow. I didn't find anything so I decided to come up with my own design. I started out by sketching out how I thought the pattern for the shoe should look like. I decided that I would make a shoe cover as I wanted something sturdy to walk in and I already had a pair of slipper style shoes that would do the job. 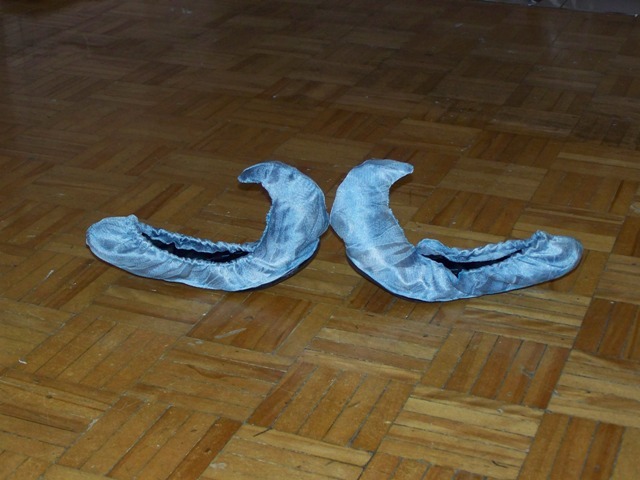 The basic idea behind the shoe cover was that it would be made of a light blue material that would be sewn onto the shoe with the toe stuffed to keep its form. Point x is the lowest point on the inside of the shoe relative to the height of the back of the shoe. 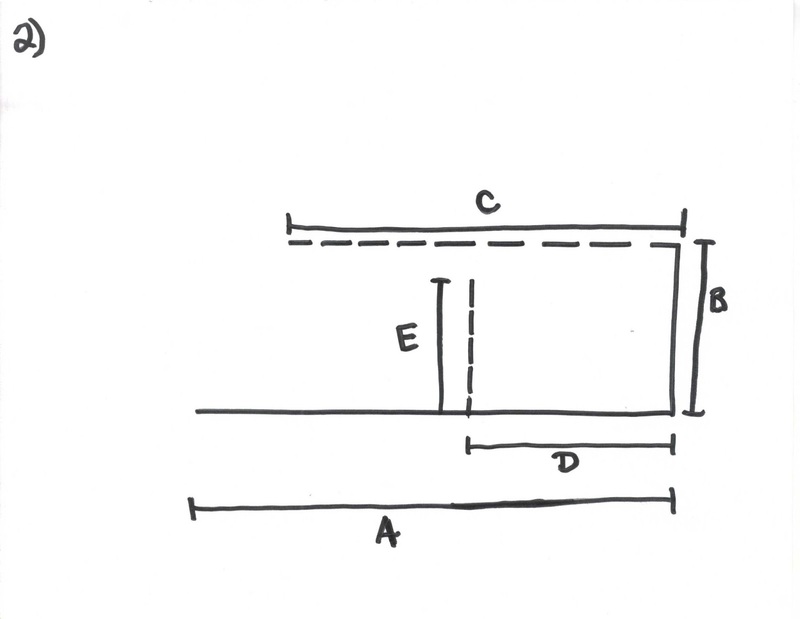 It sounds a bit complicated but the diagram should help the reader see where to take the measurement. and I drew them onto a long piece of newspaper as shown in the diagram above. 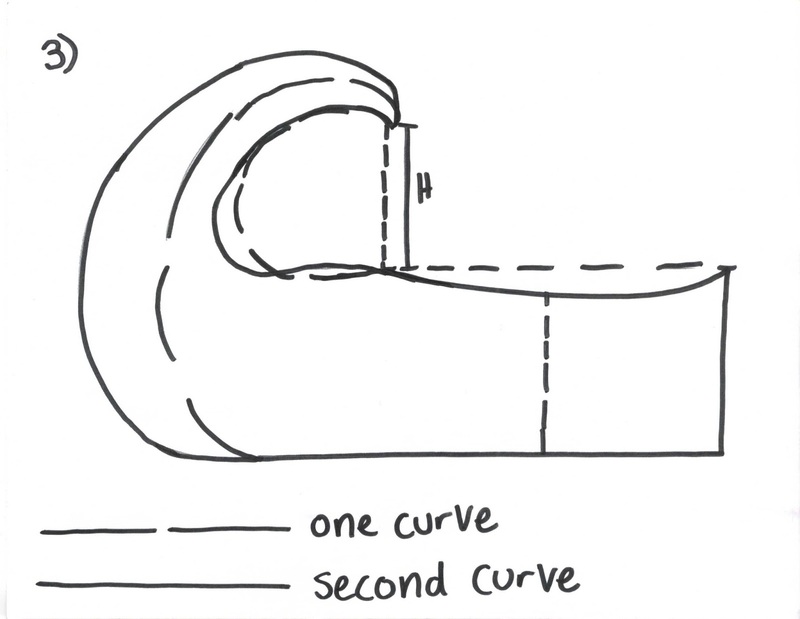 Once those lines were drawn in I drew in a curve from the back of the shoe to the front of the shoe opening, ensuring that the lowest part of the curve hit the vertical dashed line (the drawing is not completely accurate). I then decided how high I wanted my curved toe to stand. 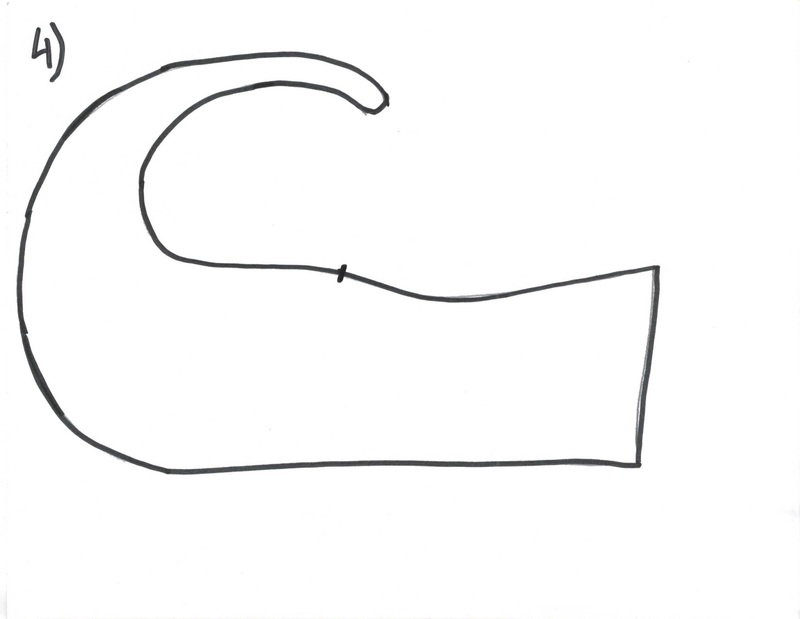 I drew in another dashed line from the front of the opening of the shoe to the desired height H. Once this line was drawn in I drew in different curves for the toe and chose one that I though suited the shoe best. 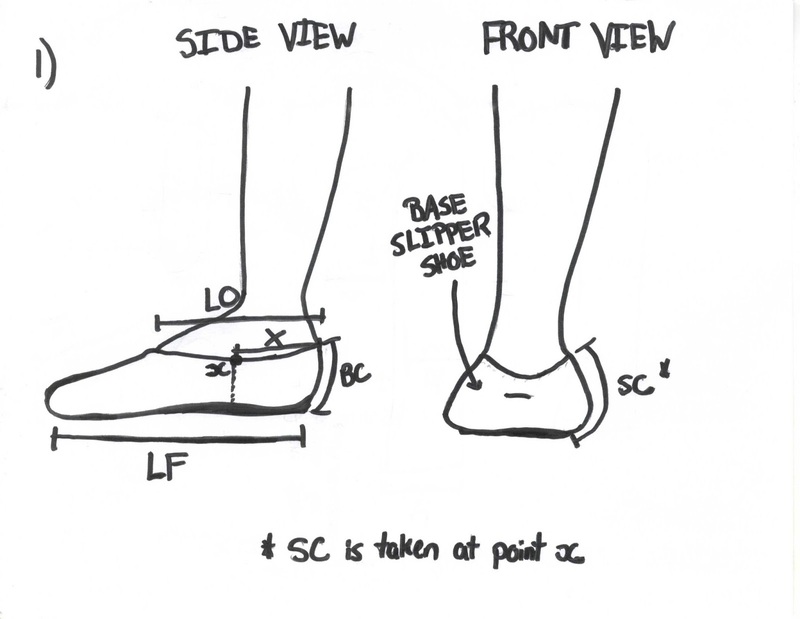 Take into consideration that this curve has to go out enough so that it doesn't come up short on the actual shoe. 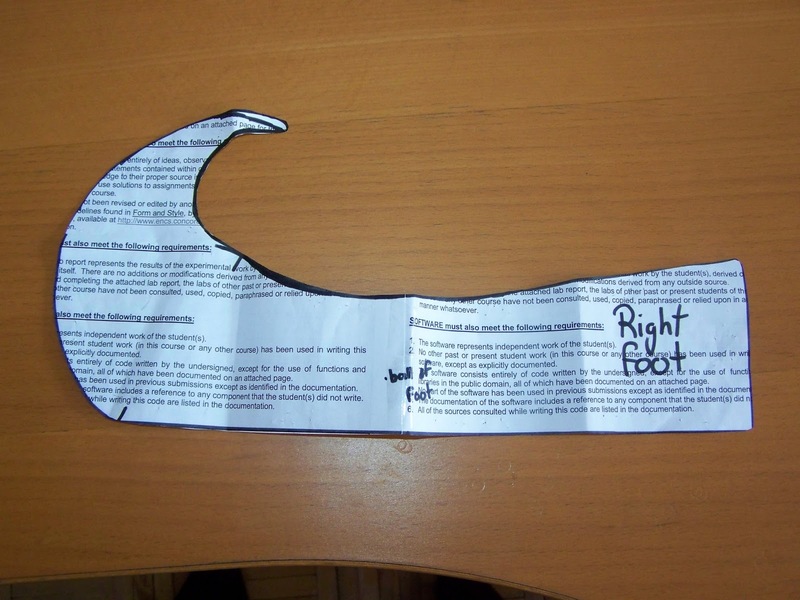 Once all my lines were drawn and I had chosen my shoe curve, I darkened the lines I wanted and cut out my pattern. Pattern Drafting complete! Cut out your material, putting the pattern on the wrong side of the material. Make sure that your fabric is folded together (right sides together) so that you only have to cut out the pattern twice. 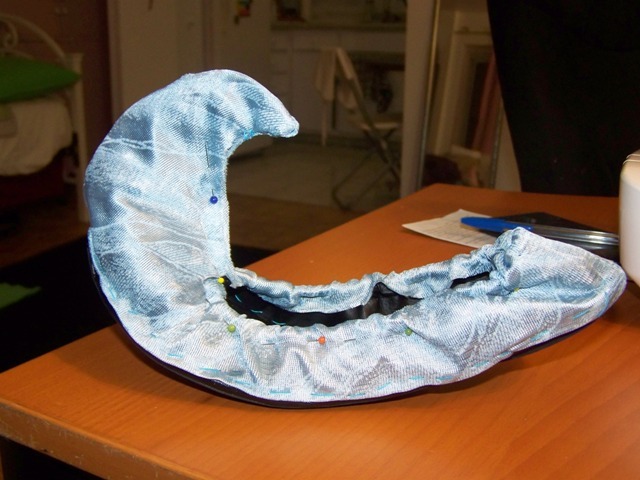 Each cutout will give you two pieces of fabric which will be sewn together to create the shoe covers for each shoe. Take one pair of fabric cut outs and pin them together, right sides together. You will sew two seams, one along the back of the shoe (the straight, vertical edge) and one along the front toe curve (the one that extends from the bottom of the shoe to the top of the curve and then about a quarter of the way down the curve that extends to the top of the shoe. (Sorry I don't have an image for this, I will upload one as soon as possible to help readers visualize it). Turn the shoe cover so that the right side of the fabric is facing outwards. 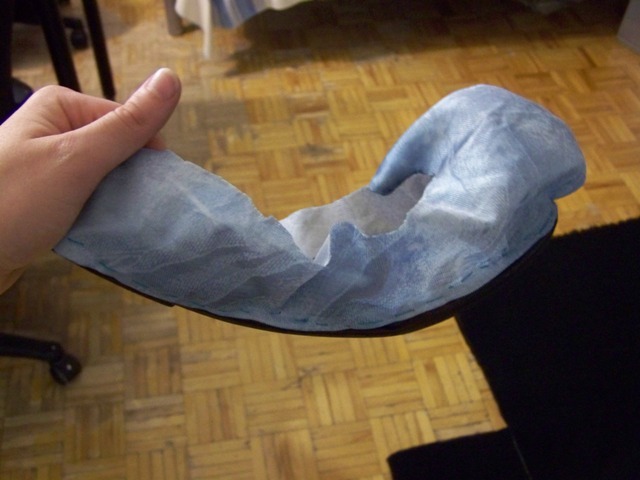 Place the shoe cover over the shoe and carefully pin in the fabric near the sole of the foot. Keep in mind that it's best the turn in your raw edge so that it's won't fray after you've sewn them and worn them a few times. This is where it get's very tricky (and frustrating and aggravating and somewhat painful if you aren't careful). You are going to have to HAND SEW the bottom of the shoe cover very close to the sole of the shoe. This should be done with a thimble and very careful fingers. Depending on the shoe material it can be very difficult to push the needle through. I had a really hard time because my shoe had an elastic opening and I couldn't see where my pins were in the toe of the shoe. Needless to say I pricked my fingers many, many times. I would advise you to start sewing at the point where the shoe is widest and work your way towards the back of the shoe. This way by the time you get to the narrowest part of the shoe (aka the toe) you won't have as many pins holding the shoe cover to the shoe. In the end this is what the shoe will look like once the bottom is sewn. If you look closely you can see my stitching. The next step is to pin down the top part of the shoe cover so that the top can be sewn. Stuff the toe with scrap fabric or batting before you pin the toe curve together. Again, try and turn in the raw edge all along the way so that you can avoid fraying along the seams. Now you can sew the top part of the cover to the shoe (again, hand sewing)! Sewing the top part of the shoe was much easier though I still recommend caution. Using a thimble will also help when you have to work near exposed pins. Once this is done you finished one shoe! Then you can work on the next one! I sprayed my shoes to protect them because I didn't want all my hard work to be ruined from simply walking in downtown Montreal. I used the Payless Rain and Stain Guard spray on them. Note that it only works on synthetic fibers (which worked out for my shoes). And Voila! You have made yourself some awesome Princess Jasmine Shoes! If you have any questions about the procedure or if anything is really unclear, comment and I will try and explain it in a different way.